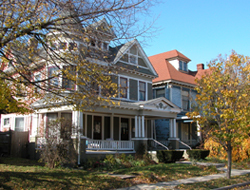 Herron—Morton Place Historic District is known for its outstanding collection of late 19th- and early 20th-century residential architecture, especially its Queen Anne houses. Many north-south streets in Herron—Morton feature esplanades down the center, adding to the spacious feeling of the lots and large homes. The area is also culturally significant as the home of a major art school and art movement. The neighborhood is named for two former institutions. Camp Morton, a Civil War prison camp, occupied a portion of the district. 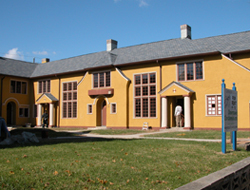 John Herron Art Institute built a small campus at 16th and Pennsylvania which was in use for decades. The neighborhood has been the home to prominent Indianapolis citizens including many of the city’s physicians, attorneys, business owners, and political figures. In 1859, the Indiana State Board of Agriculture bought a large tract of land here to establish a new Indiana State Fair Grounds. With the onset of the Civil War, however, the Union Army temporarily used the site as an induction center, and later, a prisoner of war camp interring 15,000 rebel troops. While owners of land south of 19th Street capitalized on the city’s growth in the 1870s and '80s, the campsite returned to Fair Grounds use. Not until the fair moved shortly after 1890 did local investors divide the land for residential use. John Herron Art Institute was funded by a bequest from local art admirer John Herron, whose home stood on the site. Indiana artists T. C. Steele and William Forsyth, considered the two best-known painters in the state in Indiana’s “Hoosier School” era, began to offer informal classes on this site in the 1880s. Both later taught at the Art Institute. In 1906, the school hired architects Vonnegut & Bohn to plan a museum and library building. This fine Italian Renaissance Revival building includes high-relief portrait roundels of the Renaissance and Baroque greats, Leonardo da Vinci, Peter Paul Rubens, Albrecht Durer, Diego Velazquez, and Michelangelo. Rudolph Schwarz, sculptor of much of the ornament on the State Soldiers and Sailors Monument, carved the portraits. The museum building is largely windowless, since the architects used massive skylights to uniformly light the tall exhibit rooms. By 1929, the school needed additional studio space and retained nationally known architect Paul Phillipe Cret to plan an administrative and studio building, called the Main Building or Studio Building. Cret’s design combined Classicism with Art Deco influences. Large banks of “greenhouse” windows allowed steady north light to infuse the drawing and painting studios. In the early 1960s, Herron hired young modernist Evans Woollen to plan a new wing, Fesler Hall. Though not historic, Woollen’s exposed concrete frame and arched brick windows in Fesler Hall strike a harmonious note with the other buildings. The Herron School of Art moved from this small campus at 1701 North Pennsylvania to a new campus on the west side of downtown in 2004. A few other buildings in the district are associated with the Art Institute. For example, in about 1917, Charles Williams developed the Studio Apartments, an Arts & Crafts style courtyard that included small art studios in each apartment, at 1922-1924 Talbott St. The neighborhood also includes a large and fine collection of upper and middle class homes in various styles with Queen Anne the most prevalent. North Delaware Street has a number of examples including 1922 North Delaware, which features a corner tower with conical roof and classic large front porch, and 1932 Delaware with its circular “oriel tower,” bay window, and large porch. Smaller Queen Anne cottages are also represented, such as the one at 1657 Talbott, a simple one-story cross gabled cottage, ornamented with Stick Style wood strips and carved panels. Herron—Morton Place Historic District is located on the near north side, and includes the 1600-2100 blocks of North Pennsylvania, North Talbott, North Delaware, North Alabama, North New Jersey, and North Central. The residences are private, but the Herron—Morton Place Home Tour offers a look inside some of the area’s homes. Consult Herron—Morton Place website for more information. Talbott Street Art Fair is held in summer. INDYGO bus line from downtown: #18 Nora, disembark at 16th St; walk east toward district.